We have discovered a stone path. It seems obvious now, being cleared and all. But two weeks ago it wasn't. I was headed back to the house from the little shop when suddenly, I saw them: the corners of two square stones, touching as if they meant to. I thought it was odd... why would there be two half-sunk stones in the middle of a yard? Ah. But there weren't just two, there were hundreds. The path is cleared now. How long has it been, I wonder, since it last was? My sister came for a visit yesterday and was astonished to see it. When did y'all have the time to lay this? she asked. I smiled. We walked it from the corner of the shop all the way to the steps of the long, glassed-in sun room and inside. 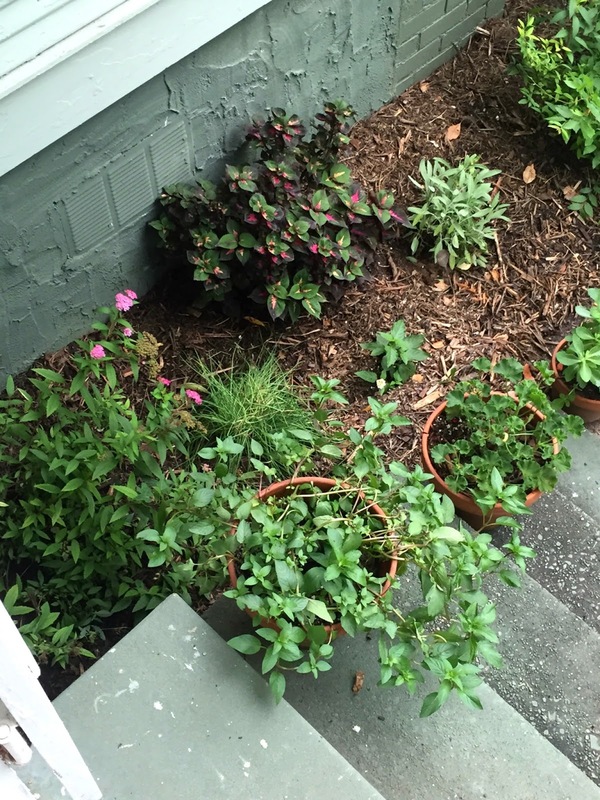 I have plans for three small gardens here: an ivy + rose garden with a gazebo on the north side, a vegetable garden on the east/south, and herbs and trailing things in beds and corners all around. 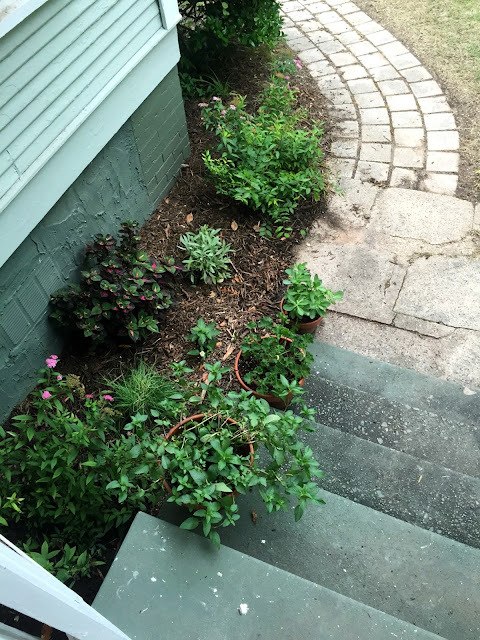 This past weekend, some chives, mint, sage and homemade butter-colored lantanas went into the ground next to the steps off the path. They're flanked by butterfly bushes. I'll wait and see how they fill in and then edit from there. As you may have heard, Tropical Storm Bill is lumbering through. It's raining now- hard- onto ground that was at saturation point weeks ago. This is stranger than any summer I remember. After the rain clears and the heat lets up, we will begin garden plans in earnest. I wonder how many steps have been taken on that path! It's perfect! What a treat that garden path is! Hope the rain lets up soon for you. I am looking forward to seeing what all is going on inside and out of your new home. I hope if you ever paint the house and shed again that you keep that same wonderful color! Quote: Nothing is lovelier than found treasures. Unquote. By me.